Urban Decay can always be counted on for unique, fun and well made products - with edgy packaging. 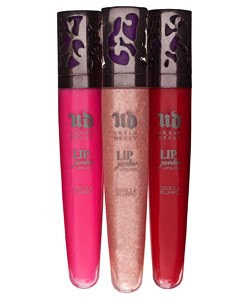 They've done it again with Urban Decay Lip Junkie Lipgloss. The tubes remind me of something out of the "Twilight" movie series - modern, but definately with a goth-like feel. Even if vampire-style is not your thing, at the heart of this lip gloss is a really yummy, sweet mint-flavored formula which contains a new ingredient that cools lips down and plumps them up while moisturizing them. (It didn't sting, burn or irritate my lips). The gloss wasn't sticky, rather it was light and creamy. Most of the shades are very true to the tube, but started out a bit sheerer on my lips, which made them perfect for layering. They have a nice shiny gloss finish and the wear is very good, especially if you lining your lips with a bit of pencil first, or with a layer of lipstick. The shades I loved the most were some of their new more "intense, goth-like" colors however. Perversion, which was my favorite and surprisingly versatile. It's a sparkly deep grey shade that I used over bare lips as well deep reds or pinks lip colors for a cool night time lip. Red Light is perfect for your red lip color lovers. Its a bright red with a touch of pink that really makes a pretty statement lip. Love Junkie is a deep red with a hint of plum. (Both shades shown below). *These products were provided courtesy of Urban Decay for reviewing purposes. Gorgeous colors in lip gloss. I would like to buy it. Thanks for the suggestions.